I like Brock, but the guy has a very limited character, replacing him was a good idea but not done the right way. I haven’t watched Pokémon regularly since May left and I have yet to see the anime Iris at all. Black and White was okay; I liked Iris and Cilan, but there was just to much filler and not enough plot. The XY series, however, is fantastic. I haven’t enjoyed the anime this much since the original series when I was six. Like it’s even possible to write better than this. Brock is more fun when he doesn’t gush over every single woman he sees. That was a joke that was run waaaaaay into the ground, and I wish they left it there. Unfortunately, they brought it back with Bonnie. Eh. It works better with Bonnie–I think in part because it’s not lechery but sincerity (it’s sweet in its own weird way and really informs the relationship between the siblings), but also because it’s Bonnie volunteering Clemont, which is just plain funnier (i.e. she’s being the embarassing younger sibling rather than Brock just being stupidly immature). The story I heard was that the decision to remove Brock happened when the cartoon started airing in English, because the Japanese producers feared that this squinty-eyed character would portray themselves in a negative light. Tracey was added to be a more obviously Caucasian character to appeal to the new Western audience. Problem was, the series was several seasons ahead in Japan, so it took several months for the English networks to reach the story arc where the switch takes place– and the Japanese fanbase was complaining the whole time. The Japanese creators more or less immediately swapped back, but it would take another several months for the English networks to catch up to the point where the characters got un-switched. I know the story. The problem is that Tracy was a poorly executed character. A guy who is superfamiliar with Pokémon that he can predict which attacks a Pokémon will use from it’s body language? Or tell if a Pokémon is in good or bad shape? That’s great. But you know what’s not fun? Watching someone sketch things, a lot. Add in that he was even less inclined to battle than Misty and Brock and of course audiences turned against him. Noted. The account I heard may have been biased; I heard it from a huge Brock fan. (I tried to make sure my version there was as neutral and just-the-facts as possible.) I didn’t personally watch much of the cartoon, though that’s mostly just because I don’t watch much TV in general. As seen in Top Secret. 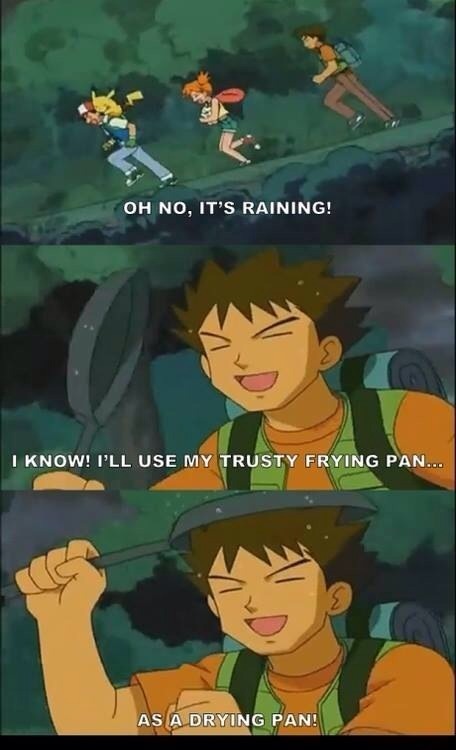 Is Brock STILL with Ash? From what I’ve heard he hasn’t been since the Unova stuff started, but I haven’t watched since about when Hoenn ended. That would be right. In Unova he traveled with Iris and Cilan and now in Kalos he is with Serena, Clemont and Clemon’s sister Bonnie. At least that’s what Walkerton tells me. …Wait, isn’t this in like 2000? Wasn’t Brock already back by then? Or is Joyce just watching reruns from the Orange Islands season? 4Kids was always kinda late with the broadcasts, so I assume the Orange islands is still on, and she’s complaining about Tracey. Okay, so I double-checked, and apparently Johto Journeys started airing in the US in October of 2000, so that probably works with the timeframe here. Early enough that Brock wouldn’t have returned yet, late enough that the lack of Brock would have been going on for quite a while. Sorry you were cold and tired Mr. W. Traveling yesterday anywhere in the vicinity of the NE and a bit west and north…yeah freak’in cold. Minus 32 wind chill where I’m at. Sorry can’t comment don’t a darn thing about this anime. Dont worry Sal you wount be judged by the rest of because…..
Doesn’t Joyce know it isn’t healthy to sit that close to the T.V. ?